Blue_Wrapping_Paper_Rolls is rated 3.7 out of 5 by 3. Rated 5 out of 5 by IAGIRL from Great quality This paper is awesome. Great quality and I had no problems wrapping my gifts. True navy and I will order from this company again. I messed up the first order and contacted customer service. They were right on it and did exactly what they said the FIRST time. Thank you. Please tell me the dimensions of the sheet of paper. Also, is the shade of blue more of turquoise, sky blue, baby blue or ice blue? Thank you. Hello. You didn't specify which wrapping paper. Please see your email for additional details. Is this navy or royal? This has a royal blue stripe. What is the width and length of the roll? What are width and length of roll for this paper? Product description says 25 sq. ft. but could you tell me the exact length and width of paper? Why do we have over 15 styles of blue wrapping paper you ask? Because blue is the most popular color in the world that's why! It is universally accepted, making it a perfect wrapping option for any occasion, including birthdays, holidays, weddings, anniversaries, graduations, and any other day that requires a gift to be given. From snowflakes to stripes, our versatile selection of blue paper will reward you with an awesome smile on the recipients' faces! Our blue gift wrap is available in many shades, designs, and sizes. Just scroll through the color swatch to see which option is best for you. Please note, the 12.5 sq. ft. options listed first are the most popular. The larger sizes are at the end. 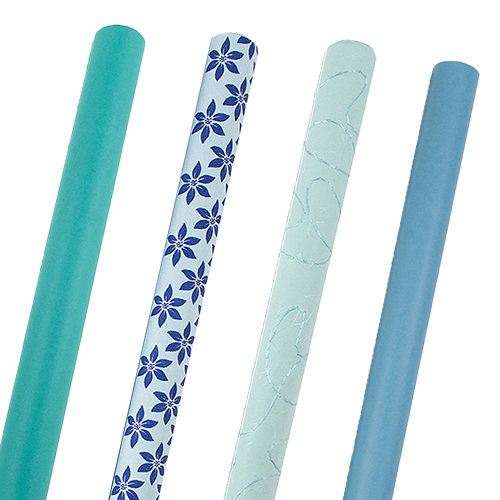 We also carry a few handmade blue rolls, which are also 100% recycled! If you want your gift to be the most popular out of the bunch, blue is the way to go!